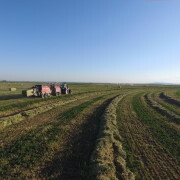 For many years farmers relied on natural dew to bale high-quality alfalfa. 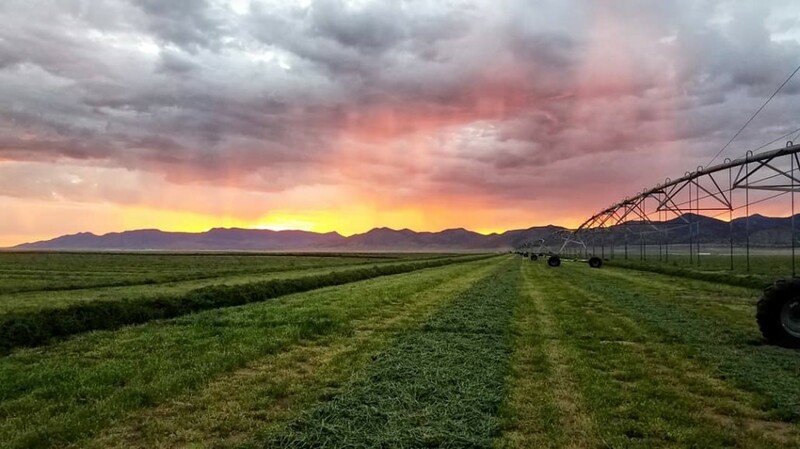 Now, farmers all across the world are using steam as their controlled moisture source to bale high-quality alfalfa. 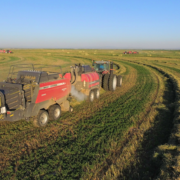 Using steam during the baling process has a number of different benefits. Using steam during baling reduces the amount of dust in hay when it is fed. Using steam increases bale density by increasing leaf retention and softening crop material. Stems become soft when steamed, allowing them to flatten as the baler plunger presses each flake. Using steam broadens the baling window. Steaming hay allows farmers to bale more hours each day when the conditions otherwise would not permit baling. Using steam will make your hay product more consistent. Monitoring bale moisture and controlling the amount of steam applied during a wide variety of baling conditions will ensure that each bale stays consistent. How Dry Should Your Hay Be Before Baling With Steam? One of the most important things to consider before baling is the condition of the hay in the windrow. For farmers using DewPoint steam technology, it is important to allow the hay to fully cure and dry in the windrow. Baling fully cured hay allows you to add more steam to the hay to bring it up to an optimal moisture level. 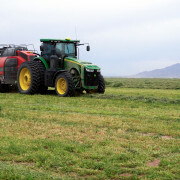 Farmers using steam may bale with or without natural dew, but stem moisture should be avoided if possible, as the steam is more effective on drier hay. Farmers operating in higher humidity climates where complete curation and dry-down is hard to achieve, may be forced to bale with some stem moisture. 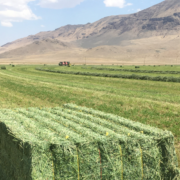 Although steam is most effective on hay that is completely cured, steam is still an effective way to retain leaves when forced to bale with stem moisture. 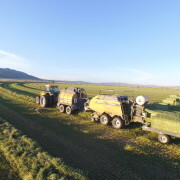 However, a proven hay preservative should be used in tandem with the steam when baling in wetter climates and operators must know their safe moisture limits of the hay preservative they choose to use. 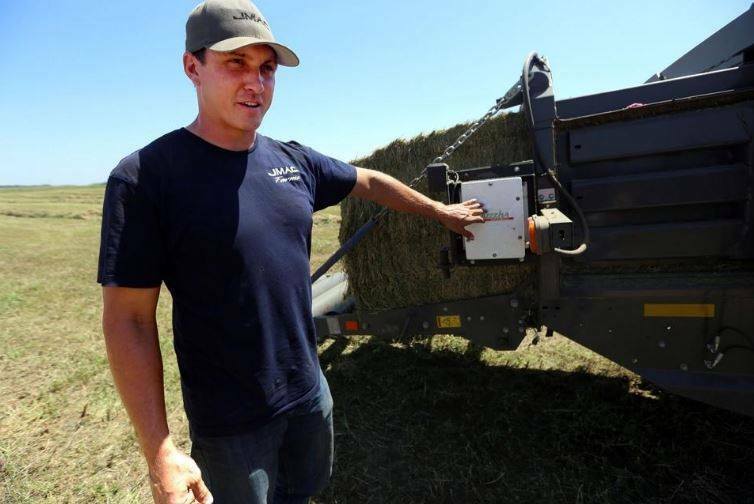 If there is any question about the moisture level of the hay before baling, a moisture probe can be used to accurately determine the moisture of the hay in the windrow. Start by checking the top of the windrow, by taking a handful of hay and pinching it around the end of the moisture probe. Typically, in dry climates, we like to see hay that is 8-10% or drier. Sometimes if the hay is drier than 8%, the moisture probe won’t pick up a reading. Next, use the probe to check the moisture of the hay in the bottom of the windrow. This will let you know if you need to add more steam to either the top or the bottom of the windrow as you bale. It’s important to remember, if you are planning to bale during the night, to check the moisture of your hay before any natural dew sets in. This will allow you to measure the true moisture of the crop material more accurately. This will also help you determine if there is any stem moisture in the hay. Hay farmers know that there can be a wide variation of moisture conditions in the low and high spots of a single field. You know your fields better than anyone. It is important to adjust your steam during baling to compensate for different moisture levels at different locations in the field. It’s also important to continually monitor your hay as you bale. Moisture levels can vary inside the windrow. In the morning, and during the day, tops of windrows are generally drier than the bottoms of windrows. Therefore, more steam should be applied to the top. It is important to check your windrows of hay occasionally as you bale to determine the location of any moisture in the windrow so steam can be applied according to windrow conditions. In conclusion, steam is more effective when the hay is fully cured and dried. We like to see hay that is cured to 8-10% in moisture. Using steam on hay that is fully cured, will allow you to add more moisture in the form of steam. Using steam on dry hay will soften the hay, and reduce leaf loss. Hay products baled with steam will be more consistent and easier to market and export. It is important to determine the condition of your hay before baling. Steam can be applied at different rates to the top and bottom of the windrow during baling. Therefore, it is important to know the conditions of the windrow and where the moisture is at in the windrow. 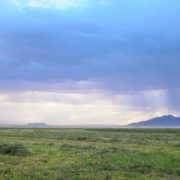 Generally, stem moisture should be avoided if possible, and where not possible, a proven hay preservative should be used in conjunction with the steam. 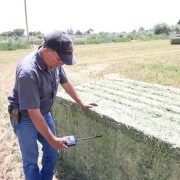 DewPoint hay steamer operators use a microwave moisture sensor to measure the amount of moisture in the hay bale as it comes out of the bale chamber. Farmers use these moisture readings to know how much steam to apply to the hay. From the first bale to the last, farmers are producing consistent bales with consistent moisture content.